LOST JEEPS • View topic - Jeeps parking next to jeeps! post em if you got em! Jeeps parking next to jeeps! post em if you got em! 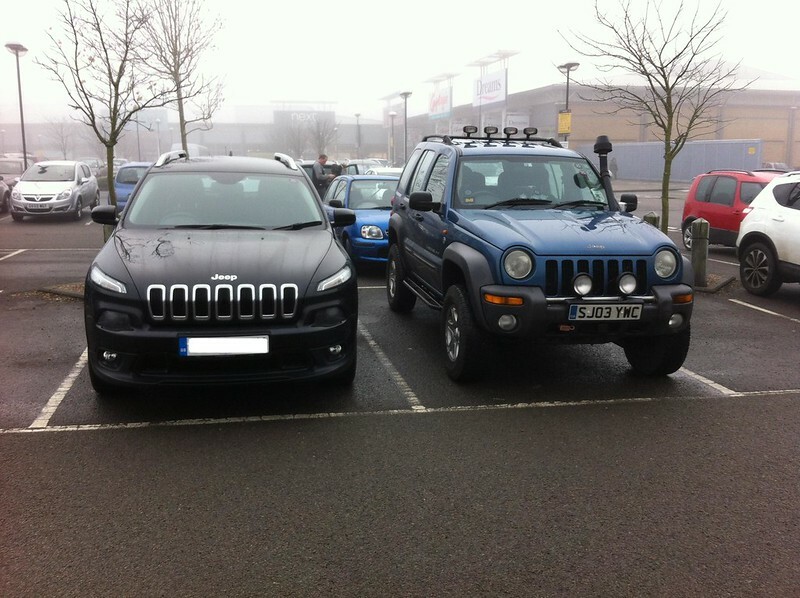 Post subject: Re: Jeeps parking next to jeeps! post em if you got em! Nice pic! Love seeing a modded Commander. He's crazy but listening to that 4.7 is pretty great. However, more power can sometimes put you in pretty hairy situations. It's the big boy version of your Lib. Not sure why he was stuck. Looked like he had enough inertia, just not the best line. Yea. We get mistaken for one another pretty often on the trails! Looked like it was a cool spot to be. How did does the Liberty do in that terrain? Do you keep it in 4hi in these conditions? he had to have it in 4hi. he was going nowhere over those loose rocks. A mixture to be honest. I used 4lo on the rocks and 4hi for slippery mud where I needed more speed. Tbh I couldhave dropped into 2nd for a couple if climbs I made to get a little more torque. Id admit, sometimes 4lo just is too low. Especially if its a 4:1 ratio. 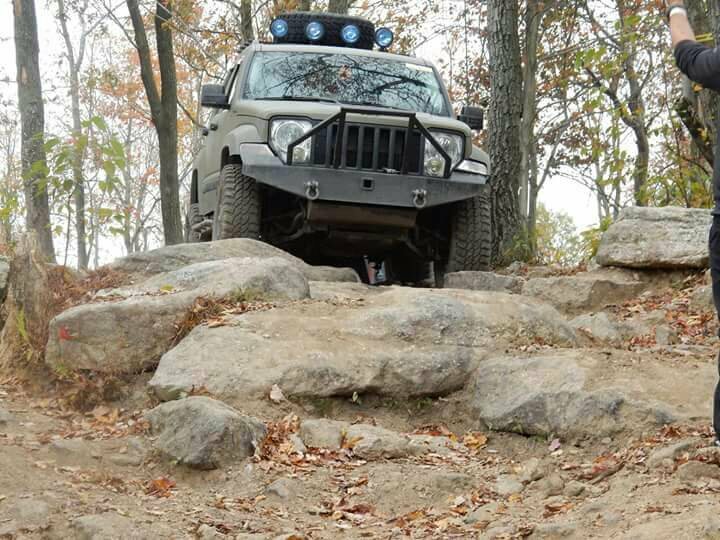 2002 KJ Limited 3.7, 5.25" lift via coilovers, custom HD rear springs, 32.2" tires on moabs (soon 33s) 4.56/JBA diff, OX lockers front/rear, NP241OR, Parker Fab front/rear bumpers, rock rails and roof rack, Viair OBA. 2006 KJ sport 3.7, 4" Ironman lift, 32" tires, Parker Fab front/rear bumpers and rock rails. Here is my two coworkers & I all parked next to one another on this fine rainy Friday morning. Mine's the KK in the middle. The silver '15 JK was just purchased yesterday. Nice picture! I love seeing different models of Jeeps together like that. I've noticed XJs and ZJs show resemblance to the KK from behind. Thanks, I thought it turned out pretty good considering it was my cell phone & the lovely weather. And yes, I do think there is some resemblance, especially with the XJ & KK. It's amazing how much bigger the KK is than the XJ. It's a heavier beast. It's also a much safer beast as well haha. They both have nice butts as well. I was quite surprised that mine is bigger than the other two, at least that's the way it looks in the pic. The weather was too nasty that day to go in for a closer look in my work clothes, etc. If you don't know already, the KK can tow more than both of them. What tires and rims do you have on that? I like them. Last edited by profdlp on Mon Jan 26, 2015 2:35 pm, edited 1 time in total. KL are still very rare here in the UK and this is the only one (UK spec) that I have come across outside a showroom. PS: I still won't buy one and most of all I don't fit in it !!! Thanks...the rims are just stock, & I have them plasti-dipped Matte Black. The tires are Yokohama Geolander AT/S. My rims are stock and plasti-dipped as well. Still have the goofy stock tires, though.